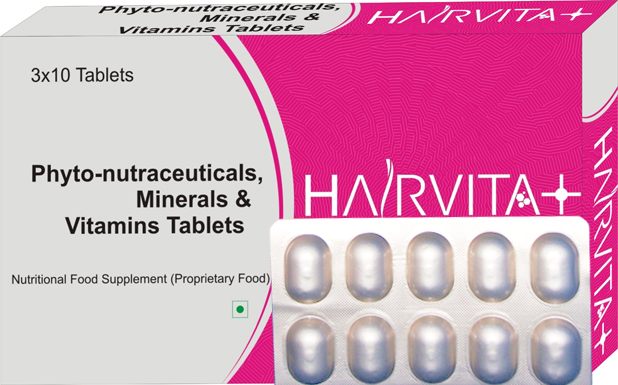 We are promoting the phytonutraceuticals and multivitamins with multiminerals tablets especially for hair growth.This combination is a promising dietary supplement that will enrich your hair follicles with all required vitamins, minerals, amino acids and natural extracts. These vitamins and minerals are capable of enhancing cell division and improving cell growth thereby strengthening your hair and improve its life period. Consuming these supplements has become a solution that increasable favored by most people today, both men and women. These supplement is not only consumed by those suffering from hair loss, but some people take these supplement to make hair thicker so it works more beautiful and healthy. ● It help to increase the blood flow in the scalp and prevent dandruff by killing a fungus called malassezia which is present on the scalp. SAW PALMETTO EXTRACT, L LYSINE Has been proven to be helpful in reducing the effects of hair loss, because it acts against the androgen in the body that contributes to an accelerated rate at which your hair is lost. NETTLE LEAF EXTRACT Preventing breakage and making hair shinier and thicker. It also stimulates hair growth and reduces baldness. INOSITOL & FOLIC ACID Stimulate growth directly to your hair roots. Hair loss can be aggravated or even caused by vitamin deficiency, and you should know what you can do to supplement your diet to help stop hair loss. ZINC Zinc is a mineral that works to increase the blood flow in the scalp and also able to widens the blood vessels in the scalp so that blood could transport more nutrients and make the hair roots could absorb the nutrients to the maximum. Nettle leaf extract is extremely rich in iron and is good for treating anemia and severe nose bleeds, stimulating circulation, and preventing hemorrhages and other blood disorders.Nettle extract is also known to help lower blood sugar levels. The high iron content is further complemented by a high amount of vitamin C. This allows the body to absorb the iron more easily and aids in normal growth and development. 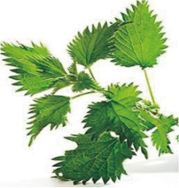 In addition to these benefits, nettle leaf extract, when mixed with alcohol, can be used as a hair tonic, preventing breakage and making hair shinier and thicker. It also stimulates hair growth and reduces baldness. Saw Palmetto is traditional topical herbal medicine used to help improve skin and scalp conditions, maintain healthy skin and hair, reverse hair loss. It is a supplement of the most sought after by men and much hair loss sufferers are already using this supplement. The seeds of saw palmetto contain ingredients that can reduce production of the hormone DHT in your body, so this hormone will not exceed its normal level. 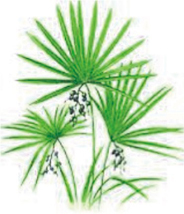 Saw palmetto has been around for a fairly long time now and has gained acceptance throughout the world. Para-Aminobenzoic Acid (PABA) is one of the essential vitamins for hair loss problems. It belongs to B complex family. It functions like an anti-grey hair vitamin. A deficiency in PABA may lead to grey hair. Research has shown its effects on animal hair cells. It is seen that when animal cells have been reintroduced to the vitamin, normal coloration is restored. Few researchers also suggest that PABA in combination with folic acid is found to be effective in restoring healthy hair. Lack of PABA may cause to affect hair color. A diet rich in vitamin B can restore hair color. It also aids in improving excellence and potency of hair growth. You can avail a plenty of PABA in liver, kidney, whole grain and yeast. (PABA) as this vitamin is commonly known is one of the lesser known members of the B complex family has been shown to be an anti-grey hair vitamin. Deficiency of PABA appears to affect hair colour. Hair colour can normally be restored with a diet rich in the B vitamins and in the few cases where colour is not restored the hair will improve in quality and strength of growth. ●	PABA helps maintain the natural color of hair. ●	PABA may help prevent premature graying of hair. 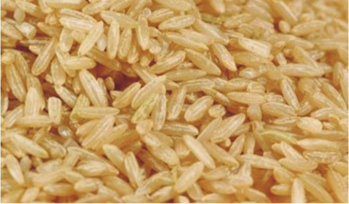 ●	PABA facilitates the production of folic acid. ●	PABA helps maintain healthy skin and intestines. ●	PABA helps in the formation of blood cells. ●	PABA helps metabolize proteins. ●	PABA acts as an antioxidant which neutralizes the injurious effects of free radicals. ●	PABA is beneficial for normal growth. ●	Help in the maintenance of healthy skin and intestines. Some amino acids are extremely beneficial in treating thinning hair in both men and women. 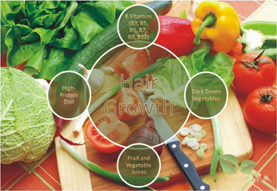 They can be used in combination with many hair loss vitamins, minerals and other nutrients that promote healthy hair and good health in general. Amino acids are the building blocks of all the proteins found in the body and hair is composed of keratin, a protein. It is this keratin which gives hair strands their strength. If amino acids are insufficiently supplied to the cells of the hair follicles, the level of keratin production will drop or the keratin produced might lose most of its strength. Both of this will lead to reduced hair growth, discolored hair and hair strands that easily fall off. Ensures adequate calcium absorption and maintains a proper nitrogen balance in adults; helps form collagen (which makes up cartilage and connective tissue); aids in the production of antibodies which have the ability to fight cold sores and herpes outbreaks; lowers high serum triglyceride levels. In practice, our body needs a healthy balance of all nutrients in our diet in order to maintain healthy life. Foods are essential to maintain healthy functioning of our system. It also belongs to vitamin B complex group. It is typically found in brain cells, muscles, liver, kidney, and eyes. It is seen that men loss their hair twice as fast as women. It is assumed that men usually lack Inositol, one of the primary vitamins for hair loss problems. Not only Inositol aids in hair loss problems, but it also offers beneficial effects in different types of skin problems. It is very essential for bald patients. Almost all types of hair loss problems can be sorted out with the use of Inositol vitamin. This is also known as vitamin H. It also belongs to vitamin B complex group. It is also one of the most essential vitamins for hair loss problems. Inadequate supply of this vitamin may cause hair loss problems. It functions in fat metabolism. Fat is essential for body growth including hair. It also helps in preventing premature graying of hair. Pantothenic acid (vitamin B5), folic acid contribute significantly in various health conditions. These are known as useful vitamins for hair loss problems. Vitamin B5 helps preventing premature graying and hair loss problems. It is primarily available in egg yolks, whole grain cereals, and organ meats. It is water-soluble vitamin B9. Vitamin B9 (folic acid and folate) is essential to numerous bodily functions. The human body needs folate to synthesize DNA, repair DNA, and methylate DNA as well as to act as a cofactor in certain biological reactions. It helps to prevent hair loss. Minerals play an essential role in nutrition. Minerals aid the human body in performing its various day-to-day functions. As these essential minerals are not produced by the body, they need to be consumed as part of our regular diet. Without these healthy minerals your body will be susceptible to a number of diseases. 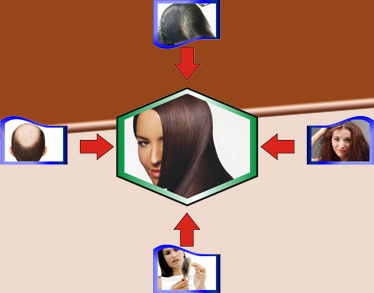 Selenium benefits for hair are two-fold. First is it aids in hair growth and second it prevent dandruff. Selenium compounds kill a fungus called Malassezia which is present on the scalp. This fungus sheds dry skin fragments. Many anti-dandruff shampoos use a little bit of selenium to fight dandruff. Having enough selenium in your diet can help you prevent and cure dandruff. Hair being primarily composed of proteins need selenium in small amounts. Because, selenium helps to utilize foods containing protein. This helps in better growth of hair. Many dermatologist recommend zinc and selenium for hair loss. Selenium along with zinc helps to utilize proteins and hormones properly which can help to produce more hair. Hormonal imbalances are one of the major reasons for hair loss. Selenium supplement can also be used in combination to treat many conditions like gray hair, miscarriages, arthritis, strokes, macular degeneration, etc. Copper has been shown to strengthen and rebuild critical collagen bundles in the skin. Strong collagen helps to nourish areas of the scalp that are vital for healthy hair growth. Manganese is a mineral form, found in our human body in very minimal amount. Manganese is an actual component of manganese super oxide dismutase enzyme. It is a powerful antioxidant that searches the free radicals in human body and manages to neutralize these damaging particles and prevent any potential danger they may cause. From the above discussion, it can be concluded that combination of natural extract, Minerals, Amino acid, Vitamins and Nutrient tablet help to improve the quality of life and promote hair growth, Preventing breakage, Reduces baldness, stops hairloss and promotes Follicle Miniturization. We are making superior quality of natural extract, Minerals, Amino acid, Vitamins and Nutrient tablet that is used to prevent hair loss, Preventing breakage, Reduces baldness. Our offered tablets is processed using high grade chemical compounds and other required drugs by our experienced quality controllers that ensure its quality, purity and chemical properties. Highly treasured among the clients for its reliability, accurate composition, excellent physical and purity, these tablets is offered to our esteemed clients at the market leading prices.